· ✈ FLIGHT MODES: Navigate with a remote control that allows full control over the Hexacopter RC. 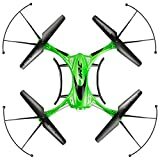 Features a retention altitude mode to allow fixed altitude free flight, a 360 degree aerial display rotation mode, a return home mode for accurate and safe return, and headless mode provides easy operation by allowing the drone to fly in any direction without worrying of the orientation. · ✈ 2.4GHZ REMOTE TRANSMITTER: New 2.4Ghz remote transmitter technology ensures smooth flight without signal interference. The control distance of the Hexacopter RC is approximately 656 ft/100m. · ✈ RECHARGEABLE BATTERY: The plane works with the rechargeable battery with USB charging. Package includes 2 batteries. The flight time is about 7-8 minutes with a full charge of 30 minutes. · ✈ WARRANTY: Tonor offers 12 months warranty, one month return.